Macrame is the art of knotting cord or string in patterns to make decorative things. A macrame lanyard can be used for many things, including carrying keys and identification cards. Macrame takes a bit of practice to perfect, but once you do, many projects can be made. Lay two cords across each other to form an "X." Use two different colors to help differentiate between the cords. Secure the center of the "X" to the table. Label each end "A" through "D," starting with the bottom left end and moving counterclockwise. Move cord "A" over cord "B." It should be horizontal to "B." Leave a space between the two cords just below the center "X." Place cord "B" over cord "A" and "C." It should end up parallel to cord "D."
Place cord "C" over cord "B" and cord "D." Cord "A" and "C" should form a backward "S" shape across the other cord. Move cord "D" over cord "C" and under cord "A" in the space you left in Step 2. At this point the knot should be loose with two ends on top and two ends on bottom. 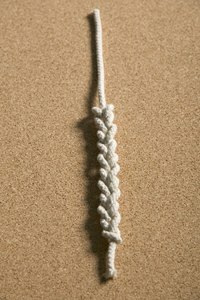 Remove the slack in the knot by pulling gently on each end until the knot is tight and square. Repeat the steps until the lanyard is as long as you want it. Attach a key chain or clip to finish the project. Pull each knot tight before beginning the next one. Try to tie each knot with the same tightness for a lanyard that lays flat.